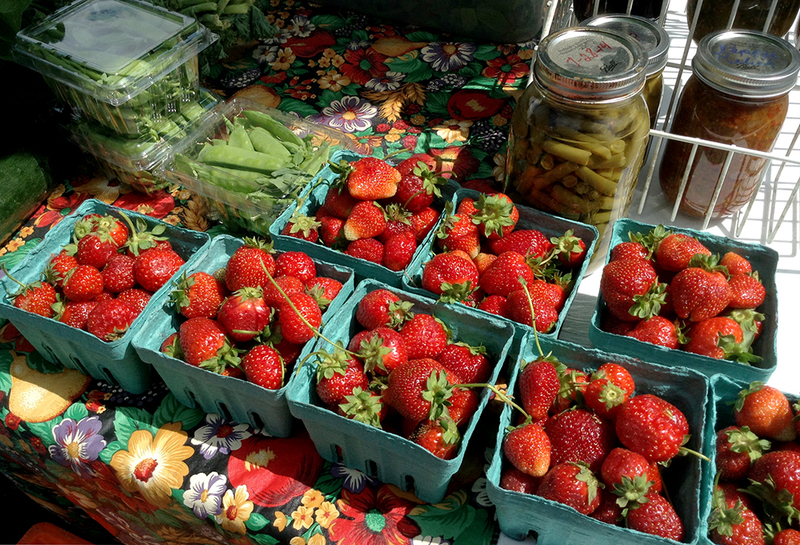 The ones you get at the grocery store just don’t compare to freshly picked strawberries from a local farm. No pesticides, and they haven’t been trucked in all the way from California or Florida. Taste the difference! What else is in season? Lettuce, spinach, kale and other greens, turnips, radishes, green onions and garlic scapes. Back Acres Farm is bringing a taste of midsummer with zucchini and tomatoes from their hoop house. Still not too late to add some plants from Village Green to your veggie garden. And, as always, you can count on finding meat, bread, eggs, cheese, yogurt, granola, smoothies and natural body care products. Looking for a treat? Aunt Flora will be there this week with her “old-school desserts and cobblers” and another new baker, Kathy Wallace, will bring brownies and cookies to the market. Princess Janice was a big hit with the little ones last week! She’ll return with stories and activities for children from 3:30-4:30. Guitarist/singer Patrick Ewing will be performing from 5:00-6:30. This entry was posted in News and tagged Aunt Flora, Back Acres Farm, Bergefurd Farms, College Hill, College Hill Farm Market, College Hill Presbyterian Church, farmers' market, Fresh Express, Grandola Granola, Llanfair Retirement Community, local food, North Oaks Farm, Our Harvest, strawberries, Twin Towers, Village Green by College Hill Farm Market. Bookmark the permalink.